The Senate approved a three-week short-term spending bill by voice vote on Friday, which would end the government shutdown if passed by the House and signed by President Donald Trump. The Senate passed a short-term spending bill on Friday afternoon after President Trump announced a deal with congressional leaders that would temporarily open the government and allow for Congress and the president to work out a potential compromise that would fund Trump’s proposed wall along America’s southern border. The bill will now go to the House, where they will likely pass it sometime Friday and then send it to the president’s desk to sign. This will end the longest government shutdown in American history. Sen. Marsha Blackburn (R-TN), one the president’s staunchest allies in the Senate, said while the spending bill will end the government shutdown, it will not end the crisis at America’s southern border. President Trump has reached a compromise with Democratic and Republican leaders to reopen the federal government with a short term continuing resolution. While this action solves the immediate problem of funding the back pay of 800,000 federal workers, it does not address the urgent need to end the humanitarian crisis on our southern border. It does not end the illegal flow of drugs, gangs and human traffickers. Congress’ work on this issue is far from over. I will continue to support our border patrol and their three essential needs: a border barrier, additional technology and more officers and agents on the border. I also support ending the DACA program, chain migration and the visa lottery system. 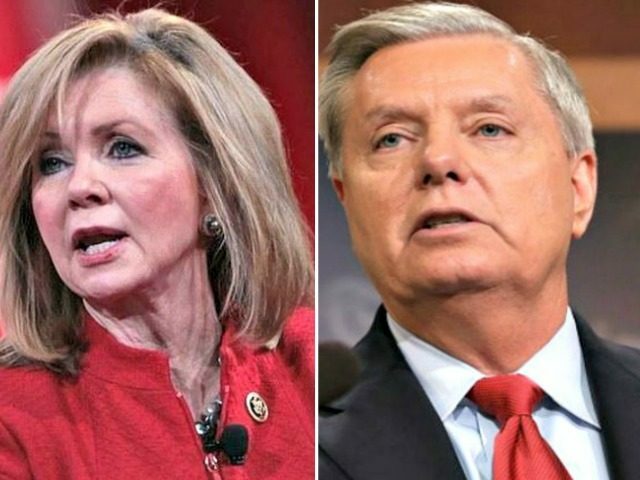 Sen. Lindsey Graham (R-SC), another strong ally of President Trump, said that now is the “last, best chance” to fix America’s broken borders and immigration system.